Originally based in Sydney, Australia, Oasis.com is an online dating and relationship networking service with increasing popularity and growing influence in North America. As of November 30, 2016 on the site's own tracking tool, the service has 17,242,133 members with nearly 500,000 of those having operated the site within 24 hours of the date. It is not hard to see why Oasis.com is so popular with singles in their search for that special someone. Oasis.com keeps things simple. You create a profile detailing identifying features of yourself, search through the profile listings based on criteria like location and gender, and decide if you like a person or not. Once you do, they will be notified and have the option to communicate back with you through the chat with contacts feature. At the same time, your profile will be available for other members to find through the search engine, and you'll receive notifications for any that give you a like or a maybe interested response. The Oasis dating site also features a matching system that automatically goes through and filters the database according to the likes of both of the involved parties. This is a great way to find the one you didn't even know you were looking for. Getting signed up with Oasis.com is incredibly quick and effortless. All you need is your name, an email, age, zip code, and a password. 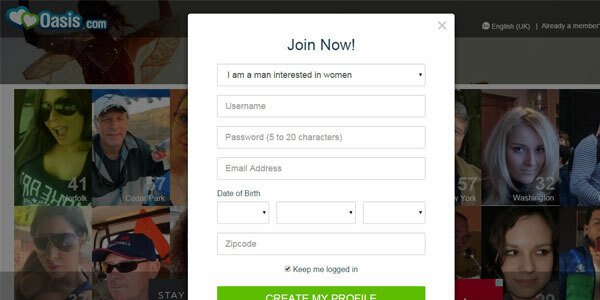 You can specify your gender and preferred gender of partner at sign up, and further options for transgendered people are available later in the profile editing process. No credit card or other payment information required unless you opt into a paid service like the Shoutouts. After creating your profile, you will need to fill out information about yourself and what type of person you are seeking in order to get the best use of the site, but neither is technically required. Now you are free to browse through any of the millions of singles on Oasis.com without having to jump through hoops or pay for the right to say hello. Oasis.com clearly states in its terms of service that is has no tolerance for disruptive, criminal, or harassing behavior of any kind. There are also protections in place against predatory practices such as automated profiles (bots) that try to convince users to download malware or provide vital information. You might notice some profiles as being flagged for review or even going missing entirely. This could be because the profile has been exhibiting bot-like behavior, or it could just be that the user is engaging in improper actions that require administrative action. You also have a layer of protection over your photos. Your uploaded pictures are divided into public and private categories. Any other user can look through your public pictures at any time, but only those that you have liked or befriended can look at your private photos. This lets you retain a greater level of control over your images, but always keep in mind that anything uploaded to the Internet can become permanently accessible and visible to anyone. The majority of the Oasis dating site is free to use after you've signed up. The site is funded primarily through advertising, which will become apparent as you continue to use it. The advertisements are non-intrusive and don't include video or sound, making them lightweight on your data plan and easy to ignore. The only paid service to be found is the "Shout Out" function. 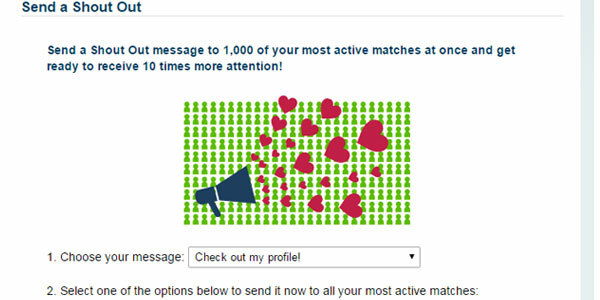 For $4.95, you can multicast a predefined message to up to 1,000 potential matches. You can try the service out for free through a Facebook sharing button. The interface design for Oasis.com keeps things simple and easy to use. Once you've logged into an account, you can see your potential matches, browse through profiles based on search filters, communicate with your contacts, and more just by using the main navigation bar. The most difficult part about using the site is an unfortunate but expected abundance of advertisements, some of which can be deceptively similar to what you would expect from a dating site's navigation tools. Our Oasis.com review finds the site to be a streamlined and effective dating platform that is great for singles across the globe. However, if you feel that Oasis.com isn’t a right fit for you, read our Zoosk review, another general dating site with a big international base. Oasis.com offers great matchmaking tools, ensuring that their users find and interact with a wide range of singles and boost their chances of finding love.